The Higher Education Act of 1876 had an enormous impact upon the development of the university. The State College was renamed a State University (Rijksuniversiteit) and Latin was no longer the official language, as it was replaced by Dutch. The university was to continue its educational activities but also take on research responsibilities. This resulted in a fantastic expansion of the building of many labs and the founding of a number of university institutes. The faculties of Maths, Medicine and Physics all benefited from this Act. A new University Library was opened on the site of the present Universitymuseum in 1864. 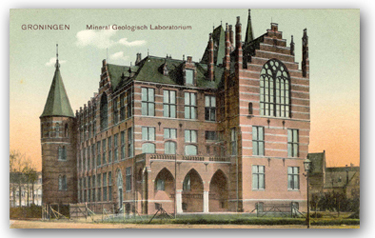 Labs were opened for Physiology (1866, beside the AcademicBuilding), Pharmacy (1880), Physics (1892, on the Westersingel), Botanics (1899, in the Grote Rozenstraat) and Mineral Geology (1901, on the Melkweg). 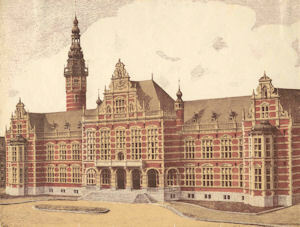 A new teaching hospital was opened in 1903 on the Oostersingel. The number of professors increased and there was the opportunity for further specialisation in a specific subject. The emphasis was placed upon the Exact Sciences. At the same time, the first professor for Modern Languages was appointed in 1881 and Groningen remained the only university in the Netherlands to offer education in Modern Languages until 1912. Women have been allowed to study at the university since 1871. 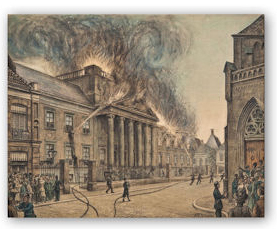 In 1906 a fire in the second Academy Building caused a great deal of damage. The priceless Natural History collection went up in smoke. Some good fortune led to the rescue of some archives, a student banner from 1665 and portraits of professors. After the fire the third and current Academic Building was rapidly designed by state architect J.A. Vrijman. The building was opened in the jubilee year of 1909 in the presence of the Queen Mother Emma and His Royal Highness Prince Hendrik. The continued successes in the increasing numbers of enrolled students, research and a growing number of labs and institutes created a jubilant atmosphere in which to celebrate the 300th birthday of the university in 1914. 68 honorary doctorates were awarded; Queen Wilhelmina was one recipient. The growth of the university continued and the 1000th student enrolled in 1924. 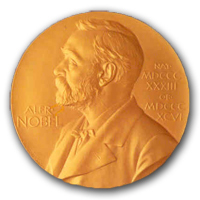 The university gained international fame in 1953 when Prof. Frits Zernike received the Nobel Prize for Physics for his invention of the phase-contrast microscope. The improvement this microscope made was very important in the field of biological and medical research. Expansion of the city after World War II meant that the university was being squeezed but city planning provided the room for new buildings for it. 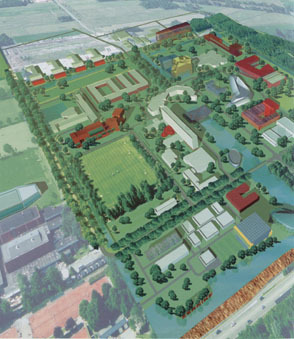 The Harmonie complex and a new library were built close to the Academic Building; the botanical garden made way for a new complex for Alpha sciences; the Academic Hospital was renovated and expanded; a new complex for Beta sciences was built in Paddepoel and a Biology Centre was created in Haren. 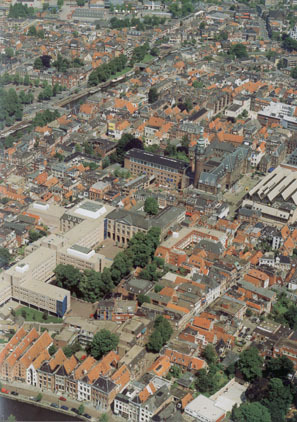 The Zernike site is named after Nobel Prize winner from Groningen, Frits Zernike. The faculties for Economics, Business, Spatial Sciences, Maths and Physics are all found here, as well as the former Biology Centre, now renamed Biology, Life Sciences & Technology. There are over 30,000 students enrolled in Groningen University and they can choose a course from 10 faculties that are housed in 150 buildings in the city and the surroundings. There are now approximately 479 professors and 5000 people working at the university. All these facts and figures mean that the University of Groningen is the third-biggest university in the Netherlands after Amsterdam and Utrecht. Last modified: 01 November 2017 3.00 p.m.